AG Adriano Goldschmied The Tomboy Boyfriend Fit Straight Leg Jeans Women's Size 26R. Condition is Pre-owned in great condition. The two distress marks on the front are factory made. Original hem has been cut. Inseam is 28". Shipped with USPS Priority Mail. Thank you for looking and please don't forget to check out my other great listings! I welcome any questions. Leg Opening: 20". Pocket: 3 Slip On Front, 2 Slip On Back. Solid Print. Cotton Blend. Waist: 28". Inseam: 28. Total Length: 39". Rise Height: 11". Style: Middi Ankle. 5-pocket styling. Button closure and zip fly. Inseam: 28". Waist: 14". Sophisticated high-rise skinny jeans are fashioned from luxe black velvet woven with a touch of comfortable stretch. STRETCH HIGH RISE VELVET ANKLE JEANS. By AG; made in the U.S.A. Dark dye may transfer to lighter materials. Ankle length. Zipper on small pocket at hip. Slim Straight leg. Rise - 7 in. Leg Opening - 5.5 in. 70% Cotton 28% Lyocell 2% Polyurethane. Inseam: 28". Dark denim with light blue hearts. Slim/Straight fit. AG Adriano Goldschmied The Farrah Skinny, high-rise skinny Jeans. Style #SPD1379-BRK, PO #AG-30750, BW17752. Material is 58% viscose, 21% cotton, 20% polyester, 1% elastane. Size 25R, actual waist measures 13 inches across, rise is 9.5 inches, inseam is 28 inches, bottom leg opening is 4.5 inches. Preowned in good condition, small amount of wear, one small faint spot on leg. Pants/jeans are in great shape. Inseam about 28". 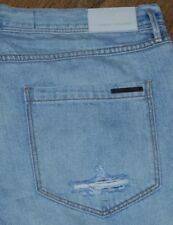 AG Adriano Goldschmied Mens Fillmore Boot Cut Jeans Size 32r - B9. Condition is Pre-owned. Shipped with USPS Priority Mail. 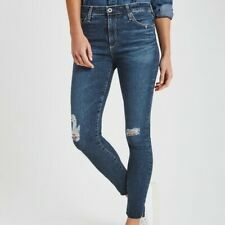 Distressed look, very stylish designer jean. Inseam measurements are approximate. MSRP 178 - 225$. These are in really great condition ~ no stains, and they aren’t stretched out. AG Adriano Goldschmied Gray Stevie Ankle Polk dot skinny jeans. Inseam 28”. Pets are kept away from products. Women's Adriano Goldschmied The Angel straigt leg gray jeans sz 28R in very good condition. Soft, comfortable, distressed edge pockets and front. No distressed holes or tears, just the fading and edging of the pockets. Cool pair of jeans. Waist: 30" Length: 35" Inseam: 28" Front Rise: 8" •	Thank you for looking! Please visit my store for more apparel. •	We do not smoke, but do have a pet. International Buyers – Please Note: Import duties, taxes, and charges are not included in the item price or shipping cost. These charges are the buyer's responsibility. Please check with your country's customs office to determine what these additional costs will be prior to bidding or buying. Please contact me for shipping cost. Adriano Goldschmied. The Stevie Ankle Jeans. Across leg opening 5.5". Slim Straight Silhouette. Inseam 28”. Across waist 16”. FABRIC CONTENT:98% cotton, 2% polyurethane - Lightweight, stretch corduroy. COLOR:Blue Polka Dot. No noted defects. - OTHER STUFF -. Fit: Slim Boot. Inseam: 28". Condition: Gently used with no flaws. Material Cotton,Polyurethane. Type Jeans. Discover daily new arrivals in all seasons, sizes and styles that you can't find anywhere else. Item Details. Color Blue/Navy. AG Adriano Goldschmied Jeans Angel Bootcut. Style: Bootcut. Inseam: 28". Waist (laying flat): 14". 15.5" across waist 28" inseam x 37" length x 9.5" rise. AG Adriano Goldschmied's The Stevie Ankle Jeans. Dark blue wash. Mid rise, slim straight silhouette, stretch, ankle length. Rise: 7.5". Inseam: 28". Inseam:From crotch seam down to leg opening 28". Leg Opening:From side to side 6.5". Outseam:From waist to leg opening 36". 98% Cotton, 2% Elastane. Waist:From side to side 14.5". 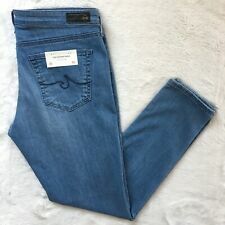 AG Adriano Goldschmied Stevie Ankle Zip Jeans Women’s Size 26R Unique Color! Style : The Stevie. Color: Black. SML02481423 in.24 in.25 in.26 in.27 in.28 in.29 in.30 in.31 in.32 in.33 in. 25 in.27 in.28 in.29 in.30 in.31 in.32 in.